Gigabyte sure has come a long way very quickly in the last little while. Here in North America, they were a relatively unknown company even just a few years ago who dealt more with OEM's the the retail market. Now Gigabyte have literally flooded the market with their products; whatever you want, Gigabyte can suit your needs. The Gigabyte 8PENXP performed very well in all the benchmarks that we threw at it, often it would perform close to the more expensive i875P based motherboards. If you feel the need to overclock, the motherboard is also quite willing, our particular test sample was able to hit a nice 225 MHz FSB while using a P4 3.0C processor. The list of standard equipment is also quite impressive with Serial ATA/Serial ATA RAID, Ultra/133 IDE RAID, 5.1 audio, IEEE 1394, Intel CSA Gigabit LAN and Dual BIOS's you're pretty much set! 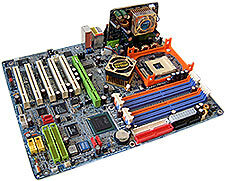 There are five PCI slots and one 8x AGP Pro port for your expansion needs. The software that accompanies the motherboard is actually useful (imagine that...) and includes one of the better virus checkers out there in Norton Anti-Virus 2003! The layout of the motherboard is excellent and even novice users will have no problems installing this board into their case! About the only thing we can complain about is the missing Clear CMOS jumpers. Soldering two solder points to clear the CMOS is not very handy and I know, I had to clear the CMOS a few times during testing. Gigabyte has done an excellent job with their P4 Titan 8PENXP, if you were to buy this board you'd certainly be very happy!